On May 21, 2008, Frontline (NYSE: FRO) announced that oil tanker owner had raised its quarterly dividend to $2.75 per share from $2 per share. At the time, the stock yielded more than 16 percent, making it a tempting morsel for income-starved investors. As the best-of-breed tanker operator, Frontline had benefited from robust demand and tight supply in its core market. Investors also reaped the rewards; the stock generated a total return of almost 250 percent over the preceding two years. Frontline’s high yield and impressive gains underscore why some of the wealthiest families in modern history built their fortunes in the tanker business. John Fredriksen, Frontline’s chairman, wasn’t born into wealth. He took some big risks in the early 1980s, parlaying a handful of assets into one of the industry’s largest empires. By mid-2008, he was one of Europe’s richest men; today, his net worth is estimated at more than $11 billion. During Frontline’s first-quarter earnings call from 2008, interim CEO Jens Martin Jensen confidently predicted that the supply-demand balance would remain sanguine in the global tanker market and that the company would continue its generous dividend policy. Jensen’s predictions didn’t pan out. Although Frontline’s shares still trade on the New York Stock Exchange, the embattled shipowner hasn’t paid a dividend in almost three years and appears unlikely to do so in the foreseeable future. In fact, some credit analysts warn that Frontline could declare bankruptcy over the next year. Although the plunge in oil prices in late 2008 and early 2009 weighed on Frontline’s results, commodity prices recovered swiftly and have remained elevated. Moreover, the stock has given up more than 90 percent of its value since Dec. 30, 2008, the day that the price of Brent crude oil bottomed. 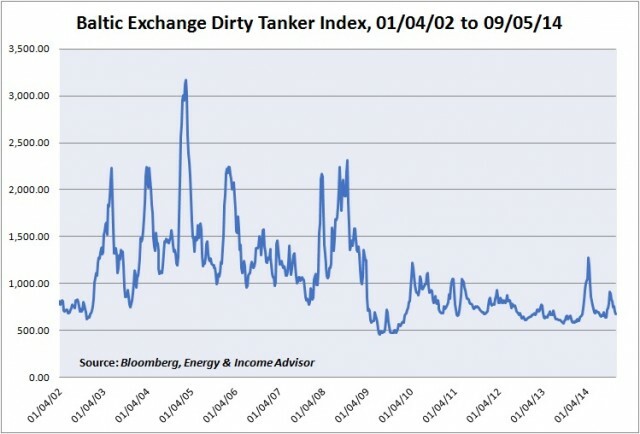 The recent history of the Baltic Exchange Dirty Tanker Index, a composite index that tracks rates on a dozen international routes, demonstrates the pain suffered in this segment of the shipping industry. Oil tankers transport as much as 90 percent of the crude oil exported from the Middle East and supply more than half of the world’s daily demand for this critical resource. Shipping demand has increased since the Great Recession, climbing to 55.7 million barrels per day last year from about 52.3 million barrels per day in 2009. In other words, the plunging day-rates earned by tankers reflects the persistent overcapacity that has plagued the market on the supply side. The fortunes built in this crucial energy industry over the decades didn’t go unnoticed; the robust shipping rates that prevailed from 2002 to 2008 prompted shipowners expand their fleets. In addition, inexperienced entrants took advantage of wide-open credit markets in 2006 and 2007 to build tankers and enter this lucrative business. By late 2008 and early 2009, shipowners had ordered enough new tankers to grow global capacity by almost 50 percent over the next three to five years, an unsustainable rate of expansion that made a lot of assumptions about demand growth. 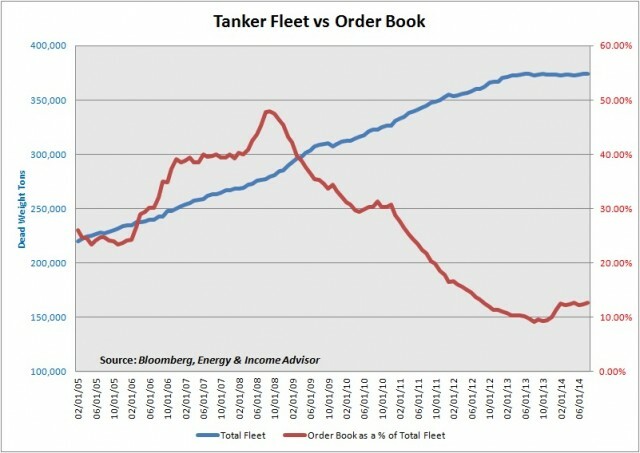 Although experienced tanker owners questioned the upstarts’ ability to secure business for their vessels and the financial crisis wiped out some new orders, industry capacity increased sharply toward the end of 2008 and surged by about one-third over the next four years. In May 2008, Frontline’s interim CEO explained why the company was insulated from any potential downside in rates, citing the long-term fixtures that locked in a highly visible stream of cash flow—while these agreements were in place. Jensen even highlighted Frontline’s ability to acquire assets from smaller competitors in the event of an industry down-cycle. But Jensen and his peers never envisioned a downturn of the magnitude and duration of the tanker market’s post-2008 collapse. At financial conferences and during Energy & Income Advisor’s monthly live chats, readers often ask if Frontline is worth buying. After all, this industry heavyweight once minted money for investors and paid out impressive dividends. Unable to cope with depressed charter rates, several major shipowners have declared bankruptcy over the past few years. Frontline looks likely to join the scrapheap after management indicated that the firm won’t generate enough cash flow to pay the $190 million convertible bond that matures in April 2015. There’s an old saw on Wall Street that it’s always darkest before the dawn. We see more pain to come for the tanker industry before the healing begins in late 2015 and early 2016. Why dust off this history lesson? Shipping magnate John Fredriksen deployed a similar strategy of leveraging up aggressively and paying a generous dividend at SeaDrill (NYSE: SDRL), an offshore contract driller we first recommended in 2007 and pounded the table for after the Macondo oil spill in 2010. Like Frontline at its peak, SeaDrill offers a double-digit dividend yield, has posted impressive gains over the past several years and remains a popular stock among income investors. Readers also frequently ask me about the name and its prospects. Moreover, SeaDrill and Frontline both took advantage of surging demand to expand their fleets dramatically and reaped the rewards of a tight supply-demand balance. Although we don’t expect the market for offshore rigs to collapse in the same manner as the tanker market, an influx of new drilling units has skewed the supply-demand balance in customers’ favor, putting the day-rates that these vessels earn under pressure. We sold SeaDrill from our Model Portfolio last fall because the stock had hit a record high of more than $45 per share and further upside in day-rates appeared unlikely. 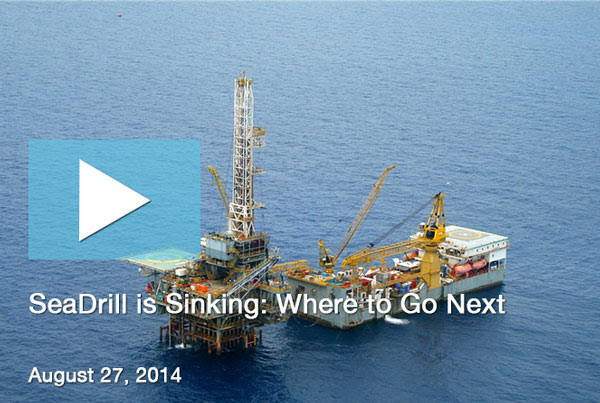 Will SeaDrill find itself in the same dire straits as Frontline over the next few years? Probably not. But the stock could test $25 per share and a dividend cut could be in the cards as early as 2016 if market conditions continue to deteriorate. Learn more about how you can profit from SeaDrill’s pain.